Shinto Tropes for Otaku Folks Be less of a baka-gaijin and learn the truth behind that anime! Religion influences culture. Nowhere in the world is this more apparent than Japan. Though both Buddhism and Shinto have had significant effects on the Japanese way of life, it's Shinto that has truly defined and shaped the country. Trying to understand Japanese culture without Shinto is like trying to understand Western culture without Christianity: it simply can't be done. I once picked up a book on Shinto and, when I finished reading it, whole new worlds in the cartoons and video games I loved so much opened up to me. I'd like to be able to share that feeling with others, if I could, so let's get to looking at some of this not-so-hidden symbolism. 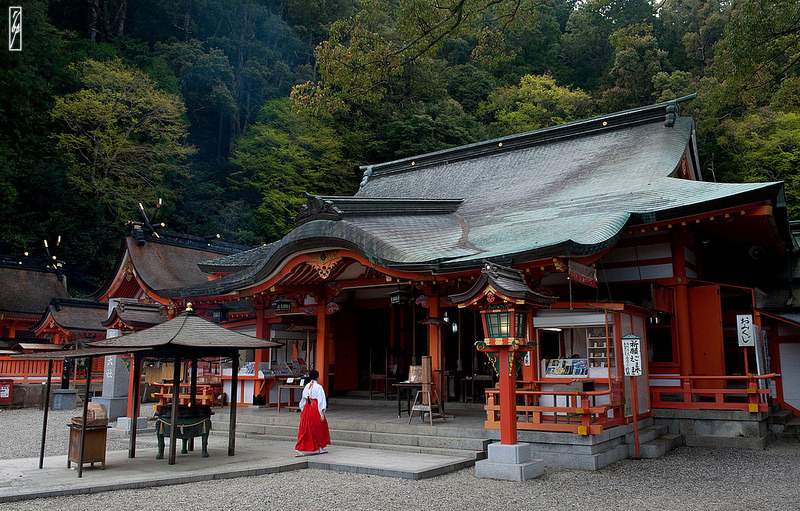 The Shinto shrine: It's a sight we've seen in every New Year's episode of every anime EVER. Children run around in their festival clothes, adults stand aside and drink sake, and there is always a fireworks show at the very end. It's a familiar scene to the Japanese and Japan lovers alike. This place is so much more than just a popular party destination, however. 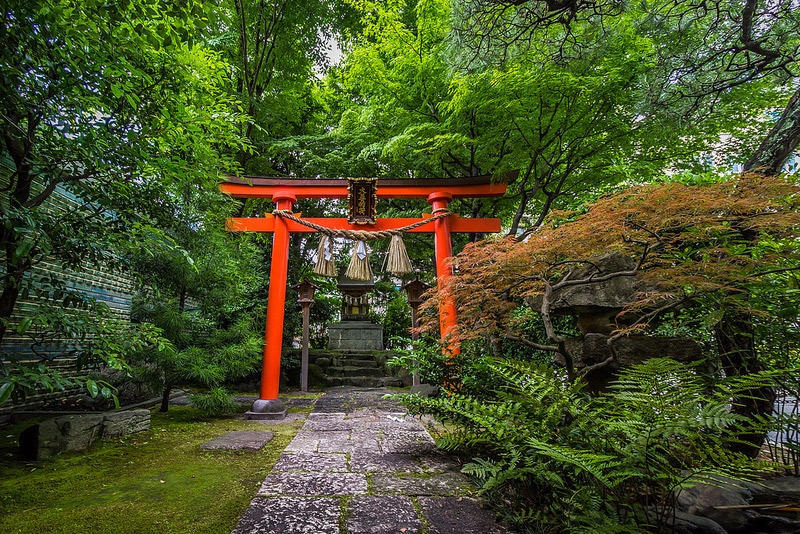 Every piece of the Shinto shrine has a specific spiritual meaning and purpose. Perhaps one of the most familiar Shinto symbols that can be seen in an animated representation of the shrine is the torii 鳥居（とりい）, the big red gate that marks the opening entrance to the shrine grounds. This is of course far from strictly decorative. Shrines are seen to be the place kami 神（かみ） (gods/spirits) manifest on earth. This leads to the belief that shrines exist between our living, tangible world and the world of spirits. The torii is supposed to mark that. Kagome's kidnapping by the centipede beast in InuYasha is a very vivid representation of this gateway. Once beyond the red gate, anything can happen. The rope that hangs off the torii is thought to absorb negative energies and trap them outside the shrine grounds. It's changed before all major festivals. 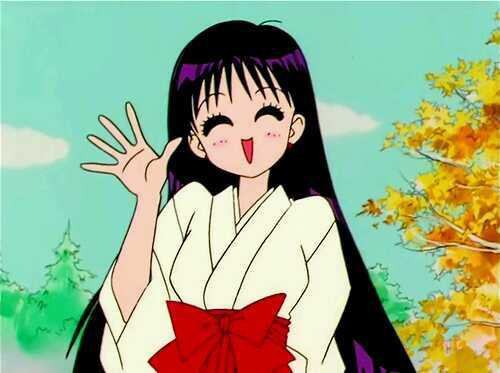 Another favorite image from Shinto used in animation is the miko 巫女（みこ）, or Shinto priestess. An example from pop culture, aside from Kagome, would be Rei from Sailor Moon. Her long red pants, white top, and wooden sandals are the customary dress for miko. She represents the priestesshood quite realistically, as she's often shown doing chores, handing out souvenirs, using ofuda 御札（おふだ） (charm cards) to banish demons, seeing the future, etc. Well…maybe those last two things don't happen every day, but aside from that, I think she'd be the perfect representation of the average miko. Rei's ofuda themselves are a type of charm card, or fortune, that are sometimes considered to be blessed by particular kami. These are the cards that always seem to be the focal point of trips to the shrine on the average New Year's Day episode of a given anime. Some people keep them and bring them home to their family shrines. 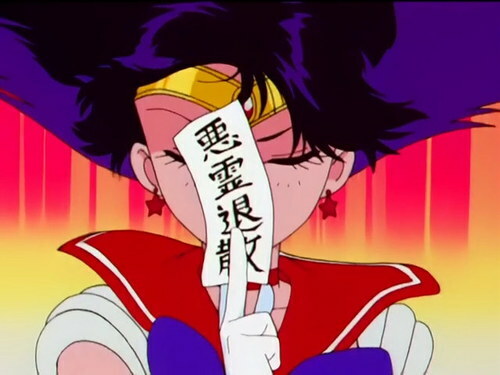 It's also customary to leave bad fortunes as an offering to the kami to cancel the bad luck. 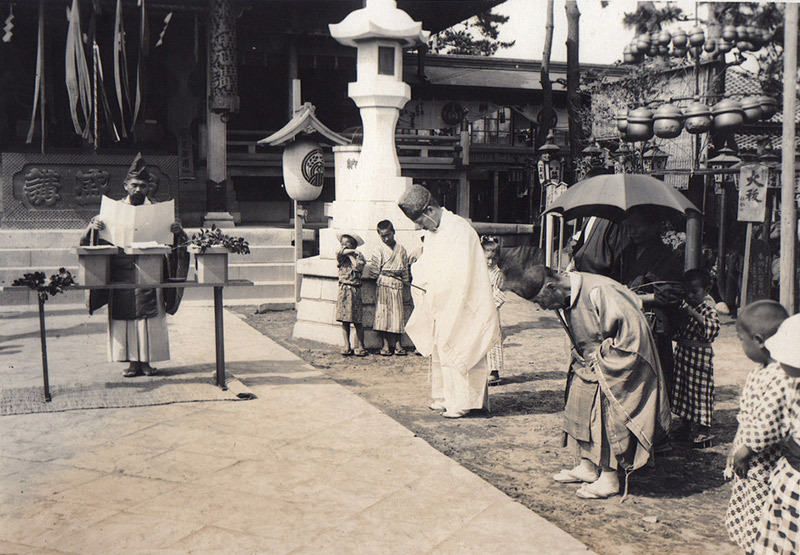 Even though Shinto doesn't have official public figures, sacred texts, or a worldwide following, there are certain beliefs shared among all the different Shinto practices that give it definition as a religion. 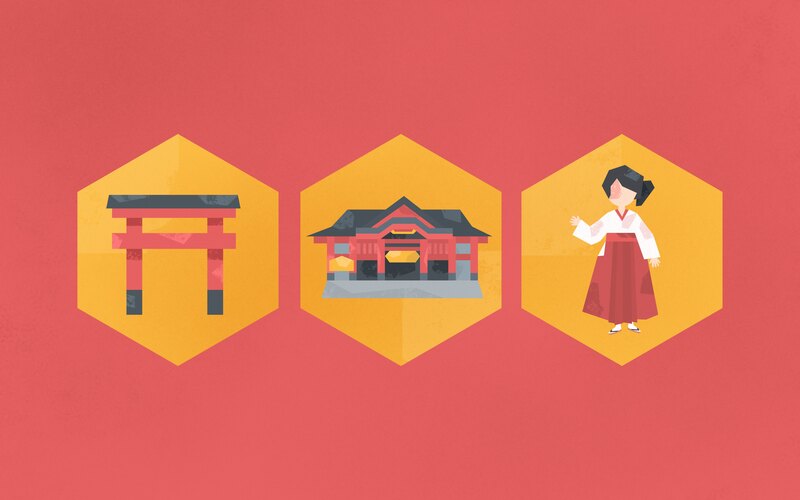 These beliefs appear at the forefront of many famous anime and game plots, even more so than visual symbols of Shinto. One of the most important concepts in Shinto is the concept of misogi 禊（みそぎ）, or purification. Typically this is accomplished with water or salt. There's a lot of importance placed upon the removal of negative energies. 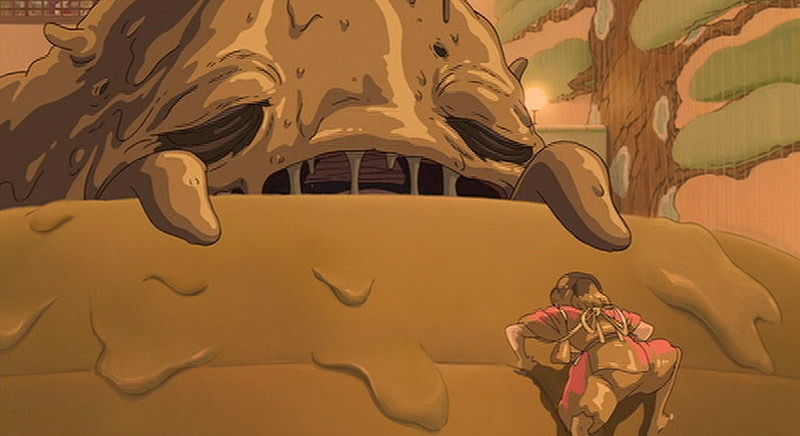 Miyazaki's film Spirited Away makes a not so subtle nod at this concept. Young Chihiro is tasked with tending to the bath house. The whole movie, while a beautiful coming of age story, is at the same time a metaphor for spiritual cleansing. Personally, I think the best example is when the river spirit, assumed to be a "stink spirit", enters the bath. Upon going through the ritual cleansing, he is able to show his true spiritual power and take on his dragon form. One of the most vital plot developments in Fullmetal Alchemist is the boys' coming to understand the mantra "One is all, all is one." While this also speaks to Buddhist traditions rooted in Japan's culture, it also indicates a sacred reverence for all life, which is key to the animist religion of Shinto. The anime/manga series Tokyo Mew Mew (Mew Mew Power in the US) expresses a deep concern over the human race's foolishness with our natural resources and our disregard for other forms of life. The aliens that appear to take the planet back from the human race could even be seen as divine messengers sent by the kami. The fact that the girls fight using the power of endangered species is also a clear nod at respect for the creation of perceived gods. The Final Fantasy series from SquareEnix has naturalist tones throughout, discussing the great life stream and the possible destruction of the planet at the hands of careless humans. In his book The Essence of Shinto, Motohisa Yamakage simplifies the concept called seimei seichoku which he calls "the source of Shinto". He says that the term means clean, happy, right, and honest. He says seimei is representative of a "clean and happy attitude of inner mind" and seichoku as "right action or behavior", and doing right by others, especially when it comes to being honest and straightforward. In the new game Bravely Default, also from SquareEnix, these attitudes are exemplified in the character Agnès Oblige, who dedicates her entire life to her religion of Crystalism (representative of Shinto, where crystals are symbolic of nature). She does so with a happy attitude and tries her hardest to help others in need. Furthermore, she never lies in order to protect herself, despite being a wanted woman. She is the very picture of Shinto, and it's hard to believe this could be any kind of coincidence. The final binding concept I'd like to address (though there are certainly more in the Shinto faith) is that of "one spirit, four souls". There have been entire books written about this subject, but I'd like to at least introduce the idea. The one spirit is known as ichirei, which represents a single consciousness. The four souls, or shikon, represent the different parts of consciousness. There are two souls that connect to our physical world and stay behind after a person dies known as aramitama (wild or untamed soul) and nigimitama (harmonious soul). Then there are the hidden souls known as sachimitama (happy soul) and kushimitama (roughly translated, this is the psychic soul) and these are the souls that join the world of the kami at death. Again we see how shows such as InuYasha really are deeply rooted in Shinto. 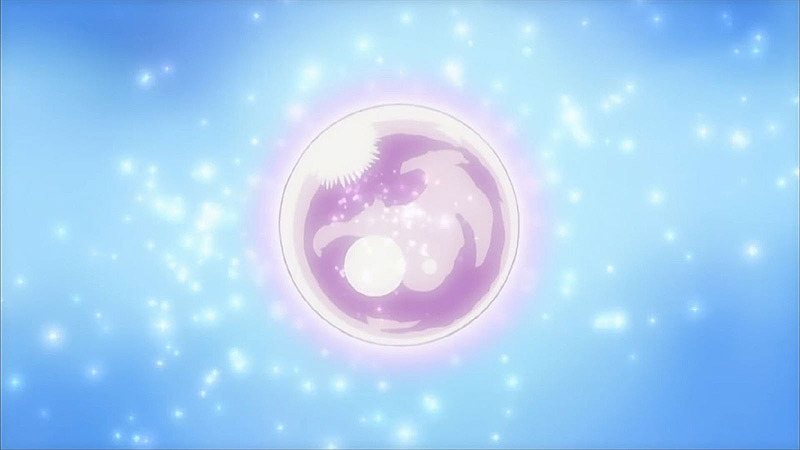 The jewel that Kagome was enlisted to protect is known as the Shikon Jewel. It is made clear that this is a sacred artifact, but when we realize it actually represents the four parts that make up a whole person's existence, we see just how important it really is. Another place this concept can be found is in the popular PS2 title Devil Summoner from Atlus. It includes four devil characters named after the four souls. Their character design makes them representative of the aspects listed above. Finally, actual kami are honored with representations in many different anime and games. The game Okami actually stars a representation of Japan's most sacred deity, Amaterasu, the sun goddess. 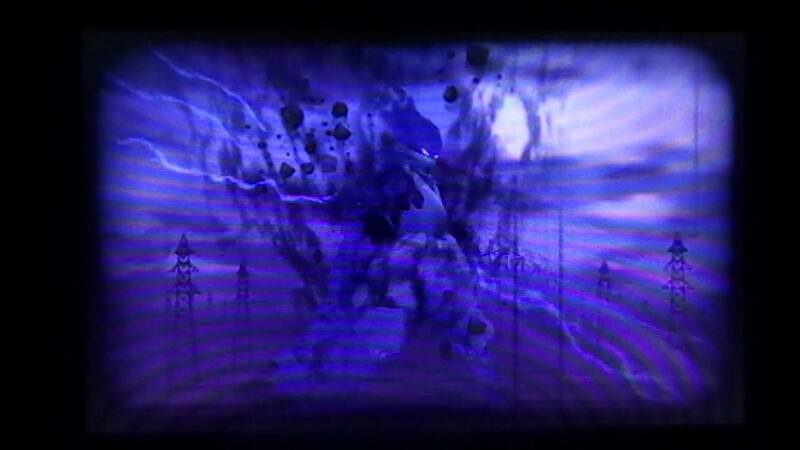 A summoning spell for wind damage in Bravely Default is named Susano-o for the Shinto god of storms. 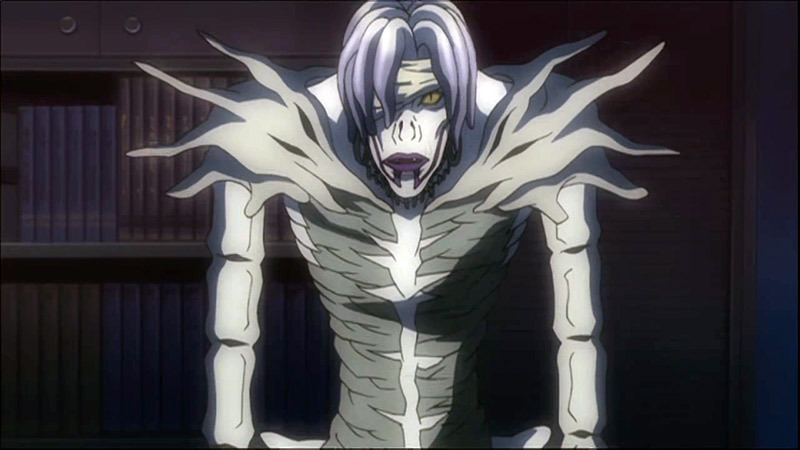 Shinigami, death spirits of Shinto, have been recreated in countless places (Death Note, Full Moon O Sagashite, and Bleach, to name a few). One of the most blatantly obvious references to Shinto in video games is actually very familiar to a lot of young people in America. If you look at the story of how the Hoenn region in Pokemon was created, it is incredibly similar to the Shinto creation myth. This is of course not an exhaustive guide to all the references to Shinto in anime and video games. These are just some of the more obvious examples. And of course, there's a whole lot more to Shinto than I could ever fit into just one article. I personally think it's a very interesting and beautiful religion, worth studying in itself even for people who aren't that interested in Japanese animation and gaming. What kind of connections have you guys noticed?